Even before I was pregnant, my husband and I would always joke about what each of us would be ‘responsible’ for teaching our children – and needless to say, I was to stay clear of anything number related and swimming. Me and numbers – oil and water, and now that I think of it, me and swimming – pretty much the same feeling! I got over my lack of confidence with numbers ages ago, but I still can’t get over my lack of confidence in the water. Don’t get me wrong, I love the sea; the sight of it, the smell of it, the sound of it – I live on an island and I can be at the nearest bay in 10 minutes – but swimming in it is a whole different story. In the photo above, I’m at the Blue Lagoon and already about 5 months pregnant. The water at the lagoon only gets waist deep, and I’m short, so that’s actually pretty shallow. It was only natural for me to enlist my husband with the duty of teaching swimming, until I heard of baby swimming classes. Secretly I knew that I would benefit from the classes as much as the baby. Henry will be 2 in a few weeks and although I wanted so much to enroll in a class when he was younger, I couldn’t since he has been in and out of the hospital. Since then, baby swimming has become even more popular here in Malta, and for good reason. With all the benefits for the parent and baby, there are few reasons not to consider joining a class. I am hoping we will be able to join a class soon. Last summer, Lidwina Schembri Wismayer started Giggle ‘N’ Splash swimming lessons for babies. 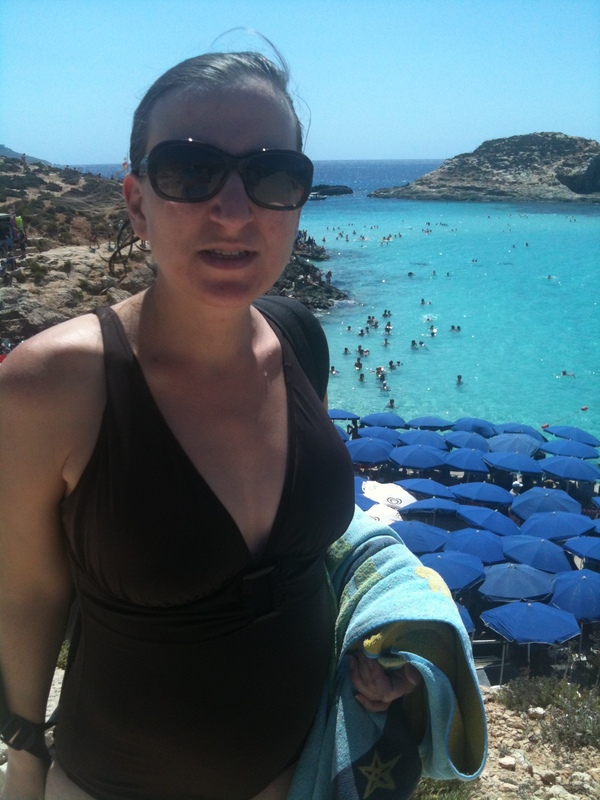 Her UK training led her to become the first Maltese qualified baby and preschool swimming teacher, and also follows the ILSP (International Learn to Swim Programme) – that gets a bunch of points in our book. We are also happy to note that Giggle ‘N’ Splash focuses on swimming with very young babies, so if you’re hesitating about your very little one out in the cold, you don’t have to worry. The pool is heated between 32-33°C and the air is also well heated, making it ideal for the very younger babies. Although the lessons are held at a public health and wellness centre, the pool is exclusively booked for the baby aquatics so there are no distractions during sessions. Lidwina, being a mother of two young children herself, is also an occupational therapist which gives her a deeper understanding of early child development. Her classes are gentle, fun and informative and empower the parent to help their child grow into a confident swimmer. Above all, the classes are a great opportunity to spend one-to-one focussed time with baby which promotes bonding and relaxation. Head on over to Giggle ‘N’ Splash to find out more information about the benefits of baby swimming. For registration information, you can contact Giggle ‘N’ Splash on info@gigglensplash.com, or call on 79394387.